The Vinalhaven Historical Society is open 6 days a week from June to September (Monday thru Saturday, 11am-4pm). We currently employ one full time Director and a part time Assistant Director, and are helped by many volunteers! We rely solely on donations from our visitors and members for our daily expences, archival material, and maintenence of the building. Founded in 1963, the Vinalhaven Historical Society is a volunteer organization for year-round and seasonal residents, and visitors to our beautiful island. Vinalhaven is one of the largest of the 14 year-round island communities remaining in Maine. The Vinalhaven Historical Society enriches the life of the island trough its efforts in collecting and cataloguing the fascinating history of our community. The Society has an extensive collection of photographic, genealogical, and vital records. The Museum houses atrifacts from the Civil War, Vinalhaven schools and homes, and tools for farming, fishing, and from the granite industry. The purpose of our organization is to collect, identify, preserve, exhibit, interpret and make available for education and research, information and artifacts which illuminate the history of Vinalhaven and its families from its beginning to the present. The Vinalhaven Historical Society building was originally built as the Universalist Church in Rockland in 1836. In 1875 it was sold at auction for $300 and transported to its present site here on Vinalhaven. The town purchased the building in 1878 to be used as a town hall. It was then leased to various organizations and businesses such as "The Rink", Ariston Club, and Smith's Band. Town meetings were held here in the 1920s and in 1947 the Vinalhaven Youth Center used the building as a Recreational Center. 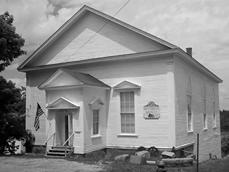 At the town meeting in March 1967, the Town of Vinalhaven gave the use and care of the building to the Historical Society.